Give your mobile workers the tools they need to get the job done right, right now with the Motorola MC65. Your workers can redefine productivity with the MC65 in hand – one of the toughest and most flexible EDAs on the market. Desktop-like application performance and our most robust scanning, camera and GPS technologies plus a customisable user interface make data capture and information access easier than ever. And with the ability to connect to virtually any carrier anywhere in the world, the MC65 rugged mobile computer can serve your business every minute of its life. An industry first: dual 3.5G broadband WAN connects flexibly to both GSM and CDMA networks. Deploy a single pool of devices anywhere in the world on virtually any network. With the appropriate service plans, users can easily toggle between networks. Interfaces Motorola Enterprise UI; customizable home screen, enhanced dialer and enterprise camera solution. The MC65 shares the same accessories as the MC55 series. 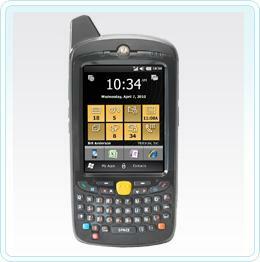 Contact Barcode Datalink for Motorola MC65 support.